Flag only, pole not included. Holder only, flag sold separately. Pole only, flag sold separately. The length of your flag should be at least 1/4 of the height of the pole. Set firmly into the ground, this 3-by-5-foot U.S. flag will wave in tricolor triumph through many holidays. It's made of heavy nylon with double-stitched red and white stripes and embroidered white stars on the familiar blue background. It dries quickly after rain, resists fading in sunlight, and remains durable in wind--yet is light enough to flap in the slightest breeze. 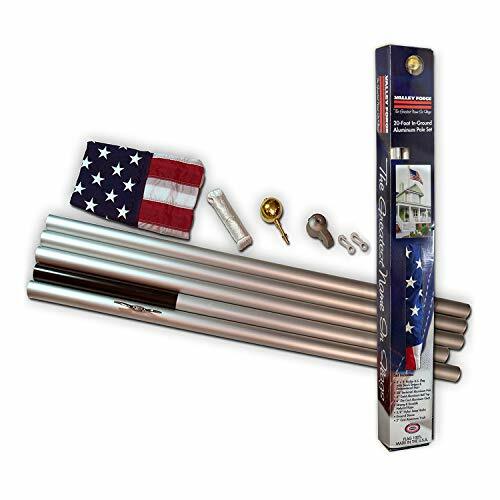 The flag attaches with simple snap hooks to a thick nylon halyard that hauls the flag up a sturdy, 2-inch diameter, 20-foot (above-ground) satin-finish aluminum pole. The halyard runs through a nylon pulley in a cast-aluminum "truck" at the pole's top and ties to a 6-inch cast-aluminum cleat. Above the truck, a 3-inch diameter gold ball, anodized like the pole for hardness, screws into the pole, and a setscrew keeps the ball securely in place. The flag pole "kit" arrived on a Friday. I had the well made flag flying high on Sunday. Real eazy to install and looks great. If you are looking to install a flag pole of your own don't pass this one up. Bracket only, flag sold separately. we got our flag and was quite thrilled to receive it. we put it together, didn't have any trouble there except the eagle wouldn't stay in. when we attached the hardware to the house and put the flag in, the flag pole wouldn't stay in so we had to screw that into the hardware also. the poles rusted after the first rain and after the first wind storm the flag pole bent in half and broke. waste of money! I received my flag as promised with in about 7 to 10 days. I opened it and was disappointed because I saw it was not exactly as described on line, it was cheap looking and when I tried to put it together the metal rods would not slide into each other very easy (one of the rods was bent). I tried to force it and it slipped and the sharp metal edge slashed two knuckles on my right hand. Looking at the cuts on my hand I knew the metal had done some serious damage to my middle knuckle I drove myself to the emergency room where I got 7 stiches. 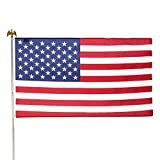 Since I just decided to go into business for myself I quit my job and lost my medical insurance and had to pay the 300.00 bill plus the bill for the cheap flag. 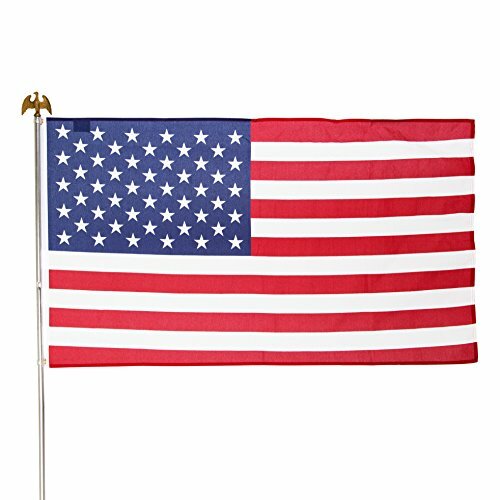 I never received my free pinwheel that was promised as a free item with the purchase of my flag just an email 2 weeks after I got my flag stating the pinwheels were not available after all. If you buy the flag becareful they are dangerous if defective. The aluminum pole has collapsed several times (it's in 3 pieces) and the flag attaches to one side of the pole with plastic pushins. You'll end up buying a better one in the end - save yourself a headache and buy a better one in the first place! We love flying our flag. It was so easy to up. After we put ours up it seemed like the hole neigborhood put theirs up too. we have lefted it flying high all winter.